Discusses the implementation of Microsoft-based content technologies and technology strategy. "This is an issue in a function that puts numbers in cells, so the values in Excel's memory are actually correct. 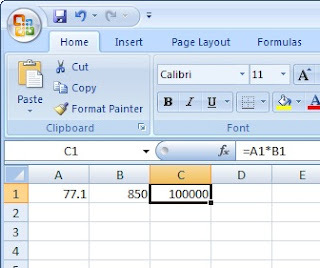 Imagine A1 contains =77.1*850 ... Excel actually calculates the correct answer, and you can see that if you use VBA to check the value for A1 - it will be 65535. But in the function that takes that value and formats it to be displayed on the screen, for the values described above, there is a bug. Any calculations based off that cell will be accurate too." In all, there appear to be 12 results in 9 quintillion that produce flawed output in Excel. From what I can tell, Microsoft is working on a patch and this bug does not affect earlier versions of Excel. Here's an entry from the Excel and Excel Services Team Blog with a more in-depth description of the issue and what they're doing to address it (also written by David Gainer). The original blog entry for Laurie's post can be found here. More background on the generally difficulties in executing math functions in a computer can be found in the following blog entry on Wolfram's blog by Mark Sofroniou "Arithmetic Is Hard--To Get Right." A new service pack has been released for both SharePoint Portal and Windows SharePoint Services (2003/v2). The KB article on the update can be found here: http://support.microsoft.com/kb/923643. Thank you to Ian Morrish at WSSDemo for posting a link to the KB article. Thank you for participating in the Gig Mindset research - If you are taking a break, hurry back! If you have finished, many thanks for your contribution. (c) Copyright 2013 Shawn Shell - All rights reserved. Simple theme. Powered by Blogger.